We are now in the last quarter of FY16, which means there are less than three months to the end of the two-year cycle in which Army Acquisition Workforce (AAW) professionals must finish the requirement to complete 80 Continuous Learning Points (CLPs). The deadline is Sept. 30. If you have questions about the requirement, please ask your supervisor or your organizational acquisition point of contact. The Army Director for Acquisition Career Management (DACM) Office is responsible for communicating compliance to the undersecretary of defense for acquisition, technology and logistics (USD(AT&L)). 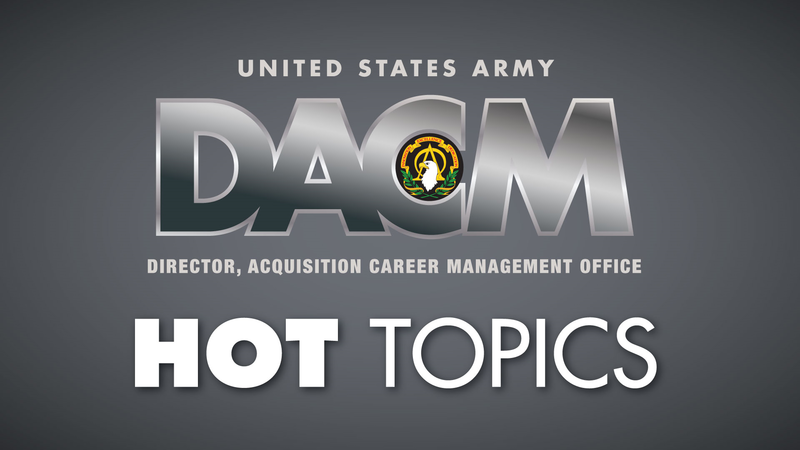 Failure to complete CLPs during the two-year cycle can affect your ability to qualify for acquisition career development opportunities offered by the Army DACM Office. The Office of the Assistant Secretary of the Army for Acquisition, Logistics and Technology, the U.S. Army Acquisition Support Center (USAASC) and the Army DACM Office continue to develop and coordinate the AAW Human Capital Strategic Plan (HCSP). On July 28, our workshop with stakeholders and experts from across acquisition career fields and organizations will help us finalize the HCSP and its supporting action plan—our guide for a systematic and collaborative process for recruiting, developing and retaining a highly skilled, engaged AAW over the next five years. During our Aug. 2 offsite, USAASC and Army DACM Office stakeholders responsible for organizing and leading efforts to accomplish each HCSP objective and its aligned initiatives/actions will meet in preparation for kicking off implementation in FY17. A link to the USD(AT&L) Acquisition Workforce Qualification Initiative (AWQI) has been added to our civilian Acquisition Career Field (ACF) models. AWQI is a tool that identifies ACF competencies to assist AAW supervisors and employees in discussions about the path ahead in their acquisition career development. The AWQI also can assist in identifying specific goals and objectives on your individual development plan. The Army DACM Office is determining the best application of this tool on our military acquisition career development models. The Army Acquisition Workforce Advisory Board (AWAB) was an initiative created for AAW professionals by the Army DACM, Lt. Gen. Michael E. Williamson, to facilitate candid discussions and honest feedback on acquisition-specific career development challenges. The AWAB initially examined three main issues facing the acquisition workforce: recruitment, training and retention. This past month, the AWAB discussed the opportunities and challenges of rotational assignments. It is preparing proposals for making rotational assignments more effective and efficient, and will hold a telecom on July 7 to decide on the best course of action to be presented to the Army DACM. For more information or if you have any questions about the AWAB, please contact Ms. Stephanie Watson at stephanie.l.watson.civ@mail.mil. 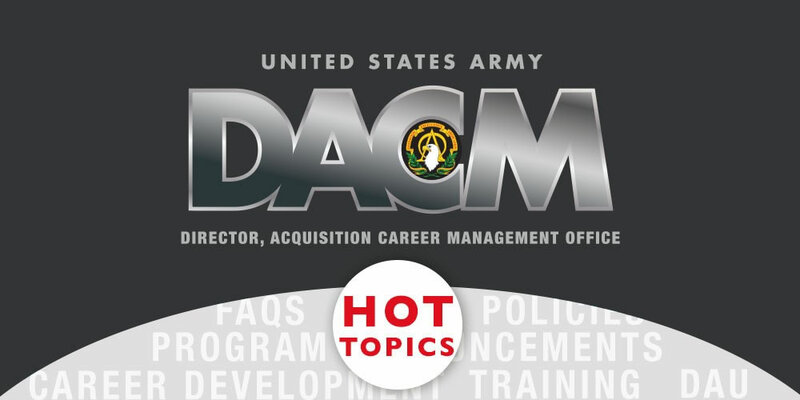 The July DACM Newsletter will be published on the USAASC Army DACM Office website on July 13. Included in this issue are articles on the Competitive Development Group/Army Acquisition Fellowship program and the Defense Acquisition University Senior Service College Fellowship (DAU-SSCF) program, as well as information about the Army DACM Office policy webpage. Looking for a tuition assistance program? The Acquisition Tuition Assistance Program application is open until July 21. The announcement for the Competitive Development Group/Army Acquisition Fellowship program is open and will close on Sept. 28. The application window opens in August for Army Acquisition Centralized Selection List positions for both lieutenant colonel/GS-14 and colonel/GS-15. Visit the program page for more information. The Defense Acquisition University is piloting courses in the newest acquisition workforce career field, Small Business. The course pilots for SBP 201, SBP 202, SBP 210, SBP 220 and SBP 301 are held from June to October, are open to all AAW members and are not limited to small business or contracting professionals. If you are interested in an available pilot, please contact your DACM small business proponent.